A2 Studios Oppo CLT20 2014 Patch for EA Cricket 07 is now available. Download here Oppo Champions League CLT20 2014 Patch for EA Sports Cricket 2007. Oppo replaces Karbonn Smart as the title sponsor of the CLT20 2014. 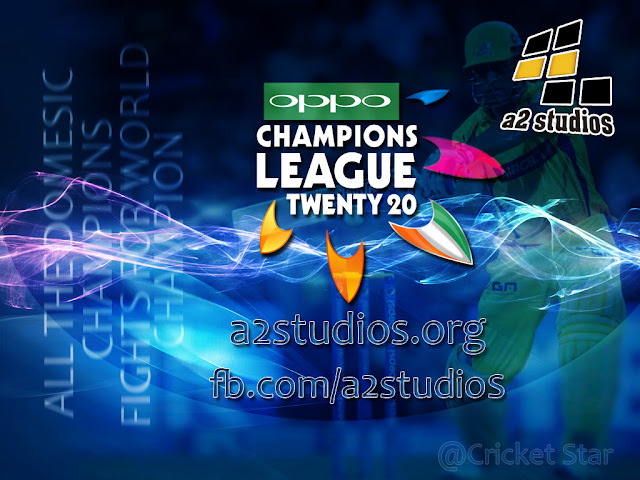 As soon as tournament kicks off, A2 Studios will start its work for CLT20 2014 Kits, Stadiums, Team Logos, Overlay, Menu, Outfields, Graphics Set Pitchad and LED Blinking Stumps, Faces, up to date Roster/Squads, Fixtures etc. However, attached is the information related to this years Oppo CLT20 Event. So keep an eye on this post for further announcements and previews of the work completed. 1. Qualifier 1 and Qualifier 3 will enter Group A on qualifying for the Group Stage. While Qualifier 2 and Qualifier 4 will enter Group B on qualifying for the Group Stage. 2. In case both Q1 and Q3 qualify for Group Stage then Qualifier 1 will enter Group A and Qualifier 3 will enter Group B. And if both the Q3 2 and Q4 reach Group stage then Qualifier 2 will enter Group B and Qualifier 4 will enter Group A. For the World's No.1 Fantasy Cricket leagues...you need to be on t20 cricket games, mate!! We are interested to Adverise on your blog. we pay you more then other companies if you're interested let me know.